Wide range of company's loudspeaker used to deliver audio at Brazil-themed charity gathering in London. An array of Turbosound loudspeakers were deployed at a Brazil-themed party in London to raise money for the Red Cross charity. Six Turbosound Flex Array TFA-600HW line array mid-highs and three TSW-218 subwoofers per side were rigged for the front of house PA system at Holborn’s Grand Connaught Rooms – all powered by MC2 amplifiers with LMS-D26 controllers. Four of the firm’s TQ-310 passive two-ways and a pair of NuQ-10DP powered two-ways handled fill duties. Visitors to the event – entitled Brazil Now! 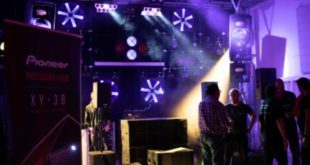 – were treated to an evening of Jazz, Bossa Nova, Brazilian pop and samba, with long-time Turbosound partner Subfrantic supplying all the production equipment including sound, light, staging, truss and video. Subfrantic also supplied all the monitoring for the band, and a separate after party room system, which consisted of four Turbosound TQ-445 three-ways, plus four TQ-425 subwoofers, again all powered by MC2 amps with LMS-D24 controllers. Ten Turbosound TFM-450 bi-amped wedges – powered by MC2 amps with LMS-D24 controllers – were used as monitors. Funds raised went directly to The Red Cross, to support thousands of its volunteers and employees currently helping people in tsunami, hurricane, flood and earthquake affected countries.